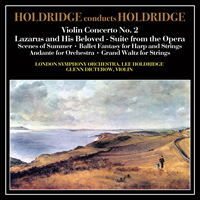 BuySoundtrax Records is pleased to announce the re-release of HOLDRIDGE CONDUCTS HOLDRIDGE, a compilation of classical works composed by Lee Holdridge. Previously released by Citadel records, famed film composer Lee Holdridge (Splash & The Beauty and The Beast TV Series) conducts the London Symphony Orchestra and The Los Angeles String Orchestra in performances of his Violin Concerto No. 2 (Glen Dicterow, soloist); Lazarus and His Beloved (Suite from the Opera); Scenes of Summer suite , Ballet Fantasy for Strings and Harp,Andante for Orchestra, Adagio for organ/violin & strings in G minor and The Grand Waltz for Strings. EAST OF EDEN is a limited edition release of 1000 units. Suite From The Opr: Part !